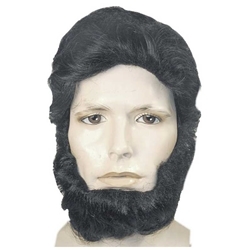 Includes a men's style black wig and a chin beard that creates the look of Abraham Lincoln. The wig features an elastic band on the inside for comfortable one size fits most sizing and the beard has an elastic band making it easy to put on and off. The style of Lincoln beard is often referred to as a "Chin Curtain Beard" and was worn by President Abraham Lincoln for a long portion of his life, including his Presidency. Pair this wig and beard set up with a stove pipe top hat to create the look of Abraham Lincoln for school projects or historical dress-up. Hint: Put the beard on first and cover-up the elastic bands with the wig.